I found a pen drive earlier. Thanks to Jeremy for the spam post on my blog yesterday, I particularly liked the Good Old Fashioned American Spam! In other news, my latest video, VEGGIEBANG, is live. It hasn't quite set the world afire as MEATYBANG did, but I hold out hope. Hey, did you find that in my car? Afraid not, but if you need a pen drive, here's a tip - go to any decent sized library (a college/university one works well), go to the help desk and say that you lost your black pen drive in there last week. With any luck they'll offer you one/some that they've found. 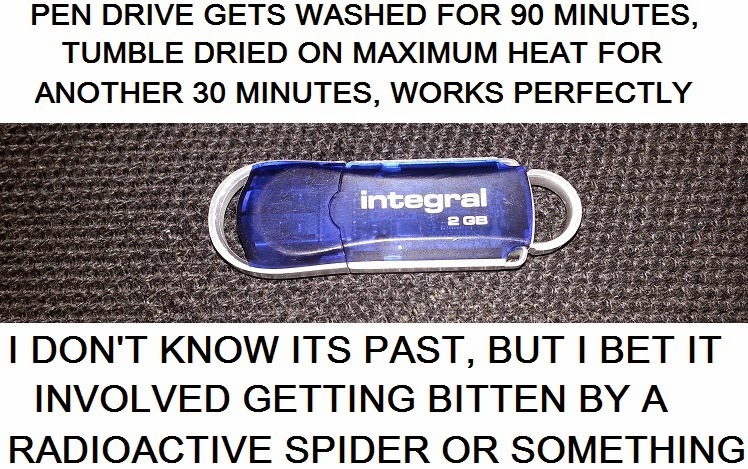 Free pen drive! Free that is except of course for the loss of any morals you may have had. Are you kidding or this is fact? 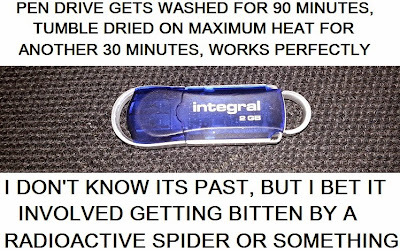 Absolutely true - I do admit that I tried it in my fiancée's computer in case there was a problem! But it worked perfectly.